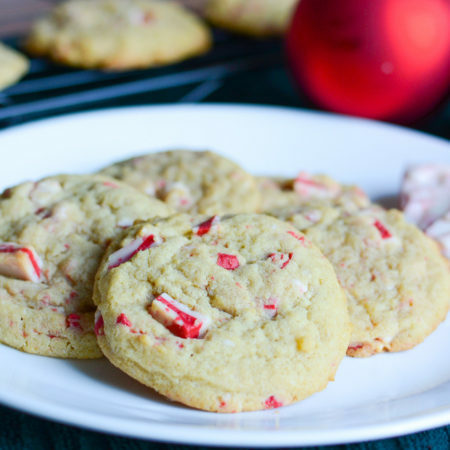 These Candy Cane Cookies are the perfect holiday peppermint treat. Studded with Andes Peppermint Crunch Baking Chips and a secret ingredient to make them extra soft and delicious! Using an electric mixer, beat butter and sugar together until fluffy. Add the pudding mix and beat until combined. Add the eggs and baking soda and continue beating. Slowly add the flour and beat until thoroughly mixed. Scoop tablespoons of dough onto an ungreased cookie sheet. Bake about 10 minutes, until edges are browned. Cool on wire racks. Or enjoy straight from the oven.